The latest numbers from research firm IDC reveal that the smartphone market continues to be a largely two-horse race between iOS and Android, which accounted for 19.7% and 76.6% market share in the fourth quarter respectively. The mobile operating systems combined to dominate Windows Phone, BlackBerry and all other platforms with 96.3% market share during the three-month period ending December. iOS increased 2.2 percentage points to 19.7% during the fourth quarter over its 15.1% market share in the year-ago quarter, while Android experienced a marginal year-over-year decline as its market share slipped from 78.2% to 76.6%. Apple shipped a record-breaking 192.7 million iPhones during 2014 on the strength of the iPhone 6 and iPhone 6 Plus, while overall Android device shipments on the year surpassed the 1 billion mark. Android and iOS continue to dominate the smartphone operating system race, resulting in a smaller battle between Windows Phone, BlackBerry, Firefox OS and less popular platforms for third place. 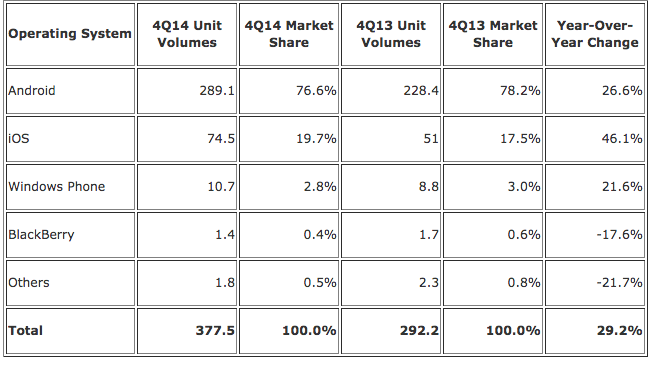 Windows Phone and BlackBerry were the closest runner-ups to iOS and Android, claiming 2.8% and 0.4% market share in the fourth quarter respectively to close out 2014. All other platforms held 0.6% market share on the year. And that's what consumers care about, a company that makes a huge profit at their expense. I hope gas goes up to $5 a gallon too! And Apple bundles it's own crapware. Apple's "Crapware" doesn't interrupt my web browsing, or auto-install more crapware when I click the "No" button, or beg for money, or insist that a virus will empty my bank account. Apple's "crapware" plays music, shows me stock prices and the photos I took, and tells me what the weather is like. 19.7% of the market yet 93% of the profits. BAM! I guess if you wrap money around your Android phone to sell it then you will get market share at the cost of declining or zero profit. And now I see all kinds of deals in the making to fill Android phones with the same type of crapware that is choking every Windows PC. Profitability is sustainability. Google is losing money on Android, and especially if Samsung begins putting Tizen on the Galaxy line as has been repeatedly rumored, Android is in big trouble. Hopefully your landlord raises your rent or your bank increases your mortgage interest rate so it can maintain sustainability. Ditto for your insurance company, power company, cable company, cell provider. And also your healthcare,and supermarket too. If we're going to brag about and support big profits, let's make it universal. What percentage of Android Corp phones are actually smartphones, running the latest version? Stop being so defensive. 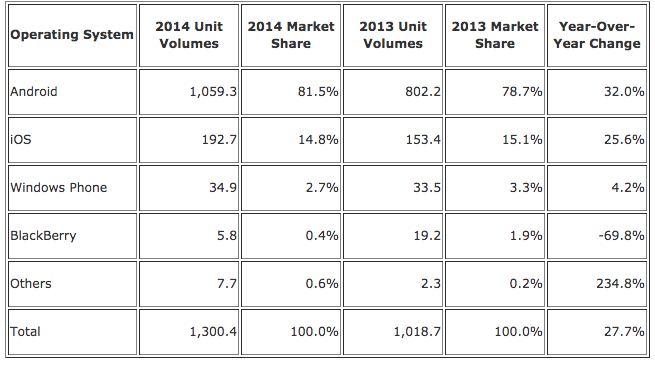 Android will always have a higher market share because they make both high and low end devices. And neither does Android, but if you had ever actually used it instead of listening to all the FUD on the internet, you would know this. But hey, let's not let actual facts get in the way of Android bashing.